This city sightseeing tour lets you absorb centuries of history, culture, sights and sounds of the dynamic city New Orleans. 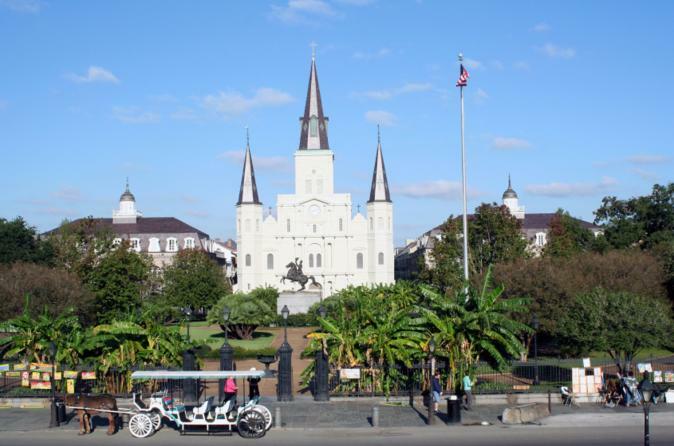 The famous French Quarter, the elegant Garden District, and St. Charles Avenue are just a taste of what you’ll experience on this insightful tour. Enjoy a grand overview of New Orleans, dubbed ‘The City That Care Forgot,’ on this comprehensive sightseeing coach tour. Start in the world-famous French Quarter, a quaint, mysterious area where the sights and sounds abound. Head to historic Jackson Square, home of the Cabildo and Presbytere museums, and visit a historical cemetery, one of New Orleans' ‘Cities of the Dead.’ Here, discover the unique above- ground burial system. Marvel at stories of voodoo and piracy on Bayou St John, the waterway used by Jean Lafitte and his band of pirates. Following the path of the St Charles Avenue streetcar, the oldest continuously operating passenger railway system in the world, pass stately mansions, the homes of former kings and queens of Mardi Gras and the beautiful Garden District. View Tulane University and Loyola University across from Audubon Park, home to the Audubon Zoo, rated one of the top five zoos in the nation. Special Offer - Save 7% when you book the 9am tour and travel by September 10, 2018. See pricing options for full details. - Book Now!